Kyle's Lemonade - Kyle in the News about CCI "When I saw all the pictures on the wall with the kids in their wheels chairs with smiles on their faces next to their dogs that helped, I knew this was the charity for me!" "When I saw all the pictures on the wall with the kids in their wheels chairs with smiles on their faces next to their dogs that helped, I knew this was the charity for me!" Kyle never imagined that his lemonade stand and his charity work would gain enough attention to have be noticed enough to be in newspaper articles, television and radio. Not one for notoriety, he has humbly spoken to the media that has interviewed him because he felt that by doing so, more people would know about Canine Companions for Independence. He feels that not enough people know about CCI and he hopes that he brings more awareness about all the wonderful things they do. For four years, Kyle Orent and his fundraising lemonade stand have been a familiar sight around his hometown of Northport. He's the cute kid philanthropist who managed to squeeze tens of thousands of dollars in charitable donations from thirsty folks who needed an ice-cold drink. Beginning at age 7, Kyle took his stand to local sports games and the annual Cow Harbor Race. He didn't charge for the drinks, but encouraged donations. He raised $20,000 the first year, his mother, Kathy, said. After four years of mashing lemons and auction sales, he's collected $115,000, all for Canine Companions for Independence, a nonprofit organization that trains dogs to help people with disabilities. But Kyle's 11 now and a sixth-grader at Northport Middle School, and the lemonade stand has begun to cramp his legs, not to mention his almost-teenager style. "I'm getting older," he said Thursday night, before accepting a "Local Heroes" award from Bank of America, in a ceremony at the Long Island Children's Museum in Garden City. The award, which includes $5,000 donated to the recipient's favorite charity, honors community leaders who contribute significantly to the health of their neighborhood. The bank also donated nearly $450,000 in unrestricted funding to local nonprofit organizations. Kyle is the youngest recipient in the six years the award has been given, said a bank spokeswoman. He says he wants to be a fundraiser when he grows up. His hero is real estate magnate and TV star Donald Trump. Why Trump? "He always has a Plan B," Kyle said. "After I sold lemonade, auctions were my Plan B." Kyle sold his own toys in an online auction, according to his Web site, kyleslemonade.org. He also writes to celebrities such as baseball great Hank Aaron, asking them to autograph dog collars. He auctions the collars on eBay's "Giving" charity site. Almost a third of the money Kyle raised came from the lemonade stand, and the rest from auctions and matching donations from individuals and corporations. When Animal Radio heard about Kyle and famous lemonade stand where all the proceeds went to Canine Companions for Independence, they asked if they could do a radio interview with him. When asked what he was going to do next, he told them about his idea to have dog collars signed by celebrites to be auctioned on Ebays charity site Givingsworks. They thought it was a wonderful idea and asked if they could help getting a sponsor for the collars. With their help and Bamboo Pet, who donated 100 assorted colored collars, the auction was a success. Kyle will be the first to tell you that it was a lot of work and a lot of letters to the celebrities he wanted to ask to sign his collars. Although not all the collars that were sent out came back , a major majority of them did. Others were hand delivered and Kyle got to tell quite a few in person about tell them a little about CCI. Kyle was recently chosen as a recipient of The Barnum Award , presently at the opening cerimony at the Barnum and Bailey Circus at Madison Square Garden. Of of the 3 kids who won for their phylanthropy work, Kyle was awarded the Gold award $1,000 to go towards assisting his charity. As always, the check goes to CCI. All three walked out and were introduced in the center ring prior to the start of the circus. CCI is celebrating it 's 35th anniversary. 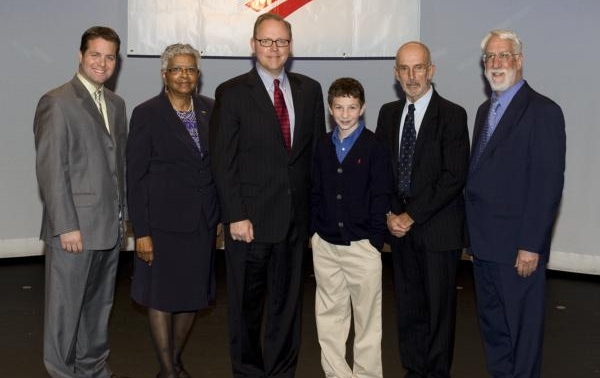 Kyle was honored by Bank Of America/Long Island Market as one of the 2009 Long Island Neighborkhood Exellence Initiative Awards as one of the Local Heroes on November 12th. He was awarded the opportunity to direct a $5,000 grant from the Bank Of America Charitable Foundation to an eligible nonprofit organization of his choice. He of course, chose Canine Companions for Independence.